Strongly inspired by the world of butcher shops and the visual devices used by these merchants to attract the passers-by, Soukaina Joual questions the strange, disturbing and seductive images and tools that come from slaughterhouses. It was during the Eid el Kebir of 2010 that the artist became aware of the graphic potential of meat. Fascinated by the colors, the forms and textures of the organs, she decided to explore their sculptural possibilities as a starting point for this work. With her solo exhibition حلال / Halal, which came after an artist residence at Le Cube, Soukaina Joual appropriates and then deconstructs the devices associated with slaughterhouses and butcher shops, in order to bring out a new range of meaning. In this way, she lets the viewer reflect on issues that are related to the body, to violence and to certain political contexts. With the حلال /Halal installation, Soukaina Joual is inspired by a typical element of the Moroccan urban landscape, the small LED board that the traders hang in their storefronts. In this case, the artist has inscribed on it the word « Halal » in French and Arabic. While these light boards are common in many parts of the world, especially the West, they are non-existent in the Arab world. 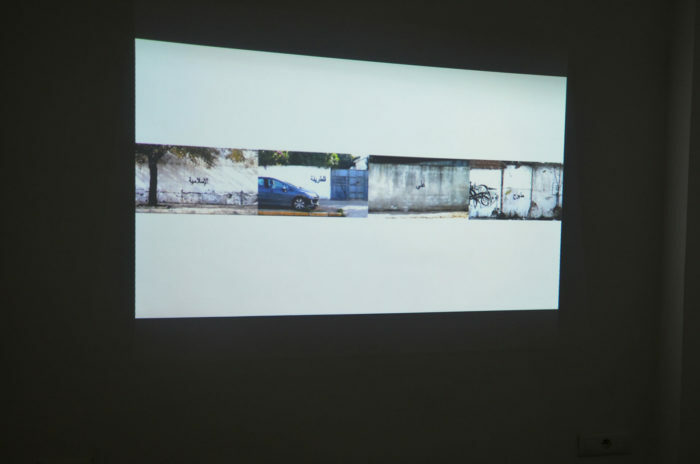 By showing these panels in a Muslim country, Soukaina Joual exhibits a ready-made which undermines the over-usage of the term “Halal”. The meaning of the term has shifted, becoming an advertising and consumer item that supports unjustifiable ends. 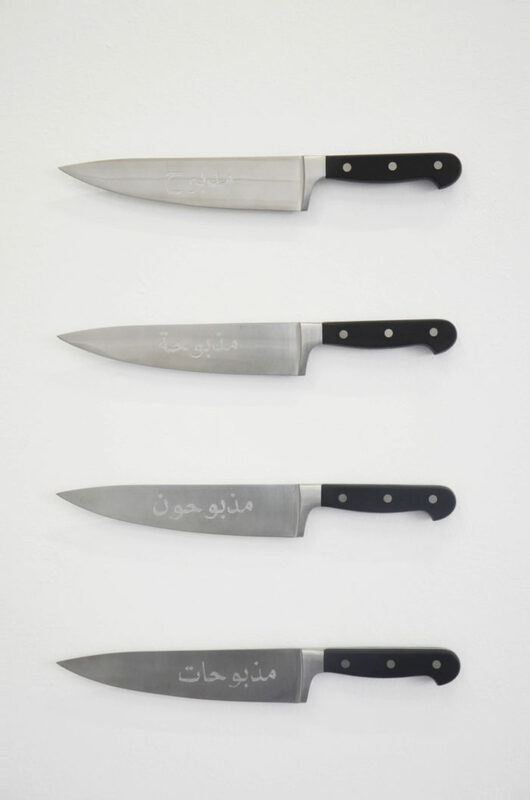 Another work done for the exhibition, Holy Knives, includes a set of four knives on which are engraved different versions of the verb to “slaughter” in Arabic. Through the association of blades and words that address all and everybody, present or absent, this piece works as a warning. 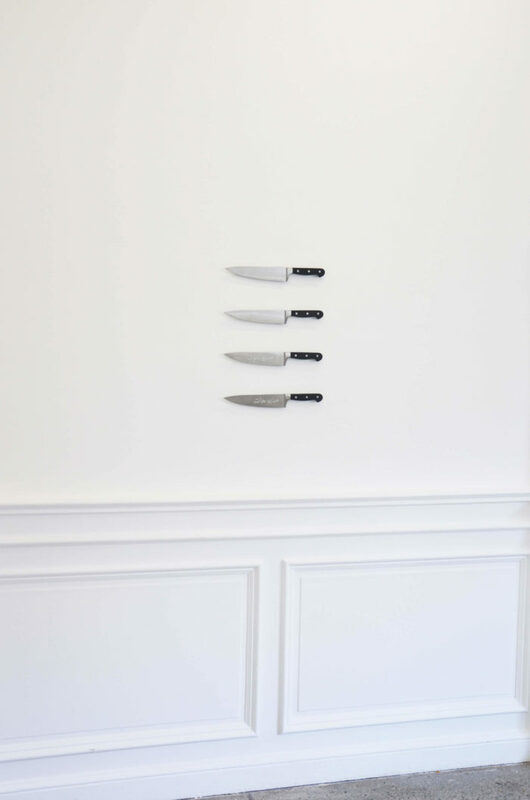 Like the sword of Damocles, the installation Holy Knives resounds like an alarm, reminding the visitor that no one is safe from a possible danger. In addition, in The Arab World as pieces of meat, a fresco painted directly on the walls of Le Cube, the Arab world is represented by the figure of a bullock ready to be dissected. Here, Soukaina Joual emphasizes at once a deadly future to which these countries seem to be destined, and the possibilities that could emerge from this association. Even though the passivity of the animal seems to have deprived it of its strength, it remains no less than a figure bearing a multitude of potentialities. Thus, with a collection of artworks that have dense and wide ranging semantic interpretations, Soukaina Joual does not seek to provide answers, but on the contrary, invites each individual to reflect and question these complex problems.